A few miles to the south-west of Port Askaig on the island of Islay lies Loch Finlaggan, a place of great importance in Scottish history. In the loch are three islands, two of which lie close to the north shore. These are Eilean Mòr (the Large Island) and Eilean na Comhairle (the Council Island), which contain fragmentary remains of buildings. Here the inauguration of the MacDonald Lords of the Isles took place. The Lords of the Isles were descended from Somerled, a 12th century “prince”, and these lords, the chiefs of Clan Donald, chose Finlaggan as their home and the centre of their Lordship, so that Islay is often referred to as the Cradle of Clan Donald. The Lords of the Isles ruled mainland Argyll and the Glens of Antrim, but at its height MacDonald territory stretched up the Great Glen to Ross-shire, beyond to Buchan and the Mearns, and south to Greenan in Ayrshire—all of this virtually independent of royal control. The heir to a strong Gaelic and Norse tradition, the Lord of the Isles (ill Innse Gall) was one of the most powerful figures in the country with the small islands in Loch Finlaggan a centre of symbolic and administrative importance. Once confirmed in his island Lordship, the Lord of the Isles, in company with his privy councillors, would retire to the neighbouring Eilean na Comhairle to discuss the great questions concerning the government of the Lordship. Here he issued land charters, of which two survive to the present day, and delivered his judgement on legal matters. Finlaggan is well signposted from the main road. When travelling north on the A846 towards Port Askaig, take a left turn about one mile after the village of Ballygrant. Follow the single-track road and after half a mile take another left turn onto the Finlaggan Farm road. Drive carefully as this is a working farm and there may be animals on the road. The Finlaggan Visitor Centre is at the end of the road. Access to the island is by a path through a farm field and a bridge across the water. The Visitor Centre is open from April to October, Monday to Saturday, 10.30–4.15. Admission prices for 2019: Adults: £4.00, Concessions: £3.00, Children: £2.00 (under 12s go free), Group rate (10 or more): £2.00. If the Visitor Centre is closed, please put money in our honesty box at the bridge just before the island or in the post box at the Visitor Centre. 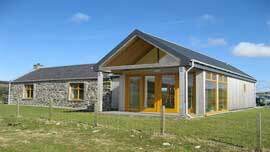 All monies are gratefully received and help maintain the site and Visitor Centre on behalf of the Finlaggan Trust.